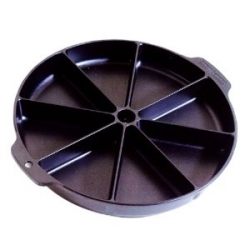 This versatile pan can be used to make scrumptious scones, moist biscuits or hearty cornbread. Use it in the oven or on the stovetop. Makes eight individual servings. Heavy cast aluminum assures even heating and provides long lasting service. Non-stick finish for easy clean up. Proudly made in the USA by Nordic Ware.